I think I can safely say that my three daughters are obsessed with horses. Ever since we arrived in Texas almost three years ago, my girls have been begging for riding lessons. This year James and I decided that they were finally old enough, so as their Christmas gift, we and all their grandparents gave them the gift of weekly lessons for as long as we can afford them. 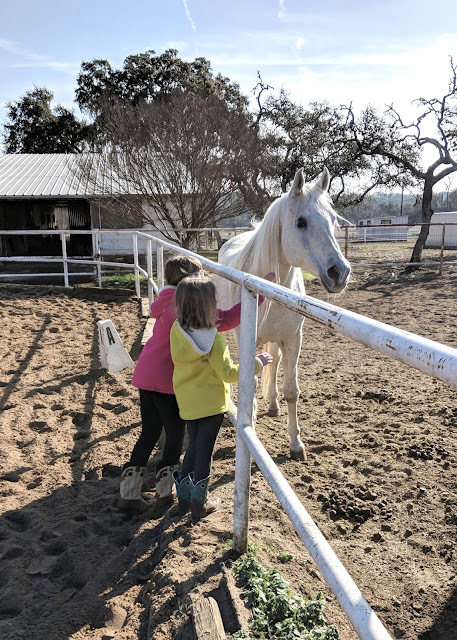 They have fallen completely in love with the horses at our local equestrian center, and we spend half a day there every week while they learn all the details of caring for and riding these beautiful animals. 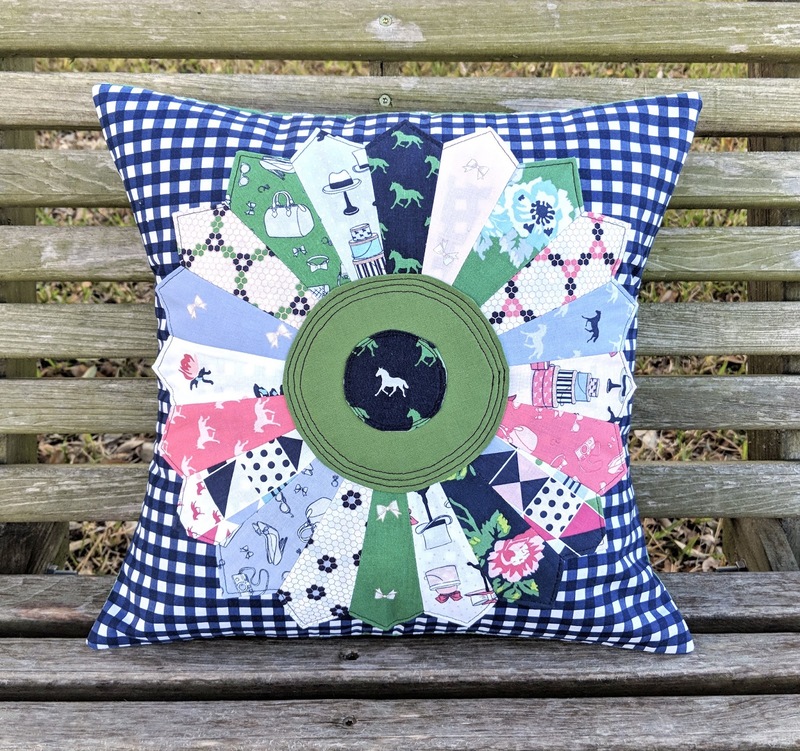 Participating in the blog tour for Melissa Mortenson's sweet Derby Day collection gave me the chance to sew up a cute horse themed pillow, and the girls were so happy to add it to the bench in their bedroom. A Dresden block seemed like a fun way to show off all the prints at once, and I wanted to feature one of the little horses in the center. I pulled in a solid green to help the center circle stand out and backed the Dresden on a navy Riley Blake gingham print. The stitching is all done with navy thread, which my youngest daughter requested, and though I usually like my quilting to fade into the background, this is a fun change. 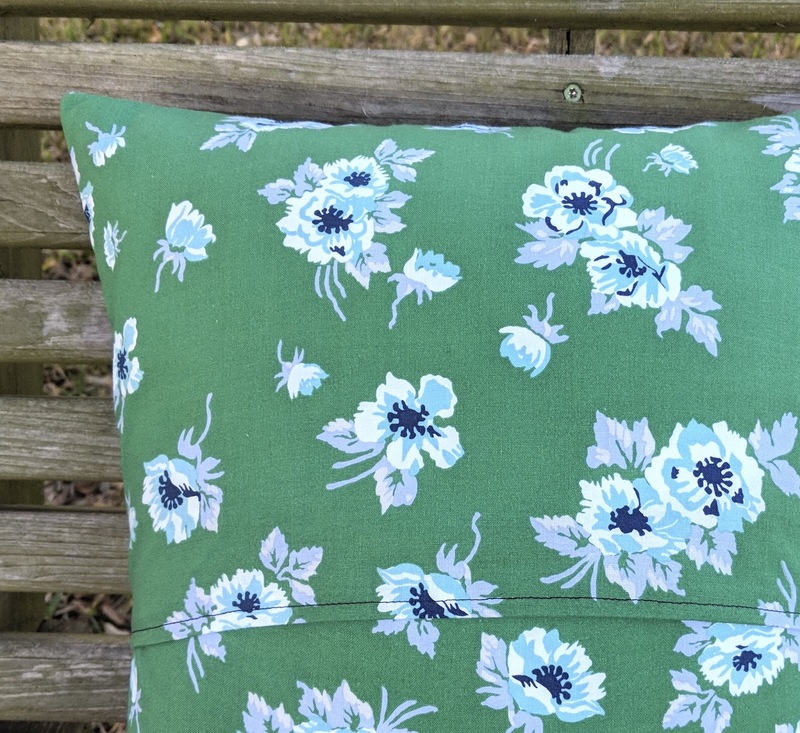 I backed the pillow in a beautiful floral print from the collection. I absolutely love this shade of green! 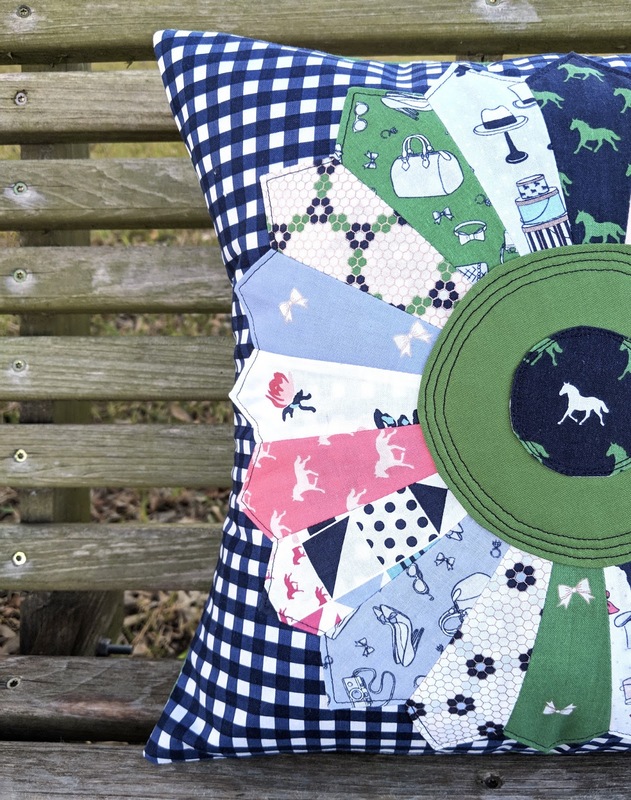 Melissa has created a stunning look book for her Derby Day fabrics which you really should see. The projects she designed for this collection are so clever and gorgeous, and there are plenty of horses and dogs featured throughout the pages too. It's everything my daughters love in one place! Be sure to stop by for a peek. It's been almost a year since the Blabberwockies first entered my life. My three girls were goofing off in the back of the car, moving their hands as if they were wearing invisible puppets and talking to each other in funny voices. "What's going on back there?" I asked as I glanced in the rear view mirror. "Oh, it's just our Blabberwockies," they answered nonchalantly. "Your what?" I glanced again in the mirror. "You mean Jabberwockies," I corrected, "from Alice in Wonderland." The girls looked baffled, shook their heads no, and tried to explain. Apparently one day my oldest came up with the idea of having their hands move (walk) as they talked to each other (blabber) -- they're "all mouth" as she says -- and the Blabberwockies were born: Tommy, Stuart, Sarah, Sylvester, Millie, Dude, Edison, Sammy & Hannah -- just to name a few of the characters they love to play. How my girls keep all those personalities straight is beyond me. It's a blessing and curse at the same time, of course. On the one hand (pun intended), they can bring their own entertainment with them wherever they go, but when things get wild, I can't take their toys away from them since they're permanently attached to their bodies. 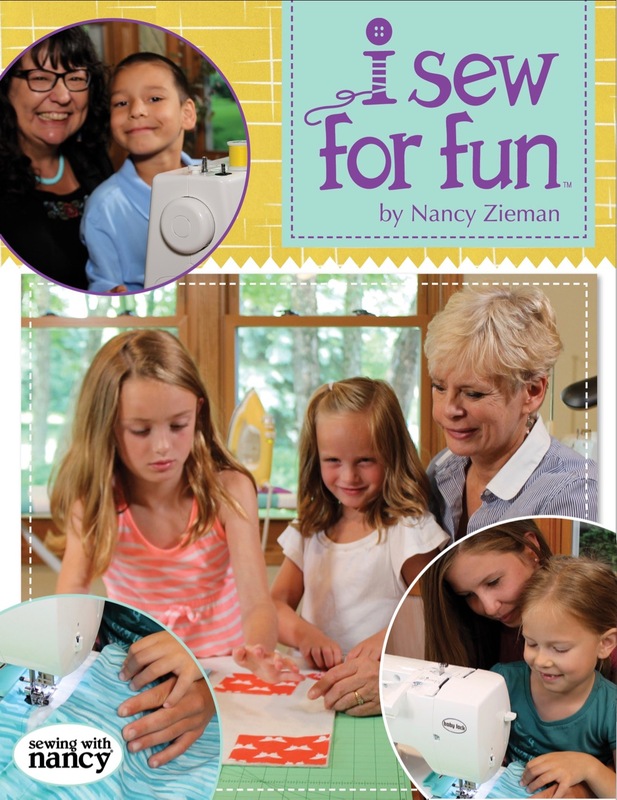 So when I was contacted by Nancy Zieman Productions to see if I'd be interested in joining their I Sew for Fun Tour, which encourages grownups and kids to sew together, I immediately went to my daughters and said, "How about if we teach the Blabberwockies to sew?" 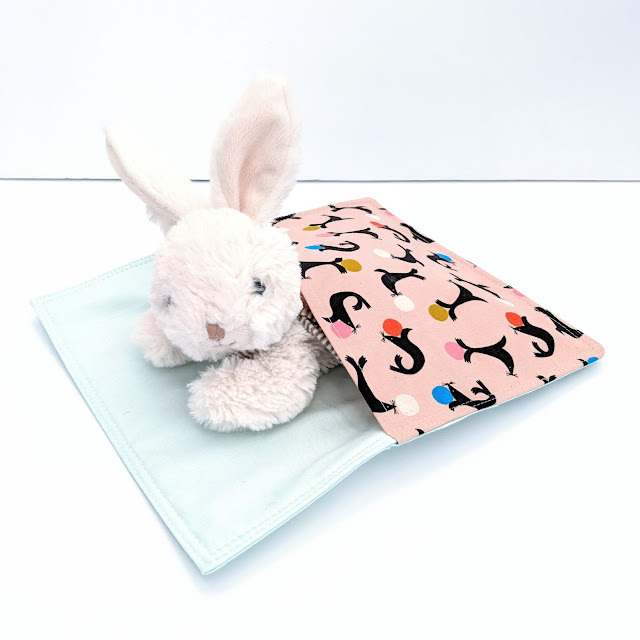 I've shared with you several times on this blog -- and in my book Sew Organized for the Busy Girl -- about sewing with my daughters, who (for any newcomers) are affectionately referred to as Bunny, Bear, and Mouse to preserve their privacy. It's something I love to do, but it takes lots of preparation and a very different mindset from sewing by myself. I really wish I had owned a copy of Nancy's book back when I got started. I own several books about sewing with kids, and this one is definitely my favorite. 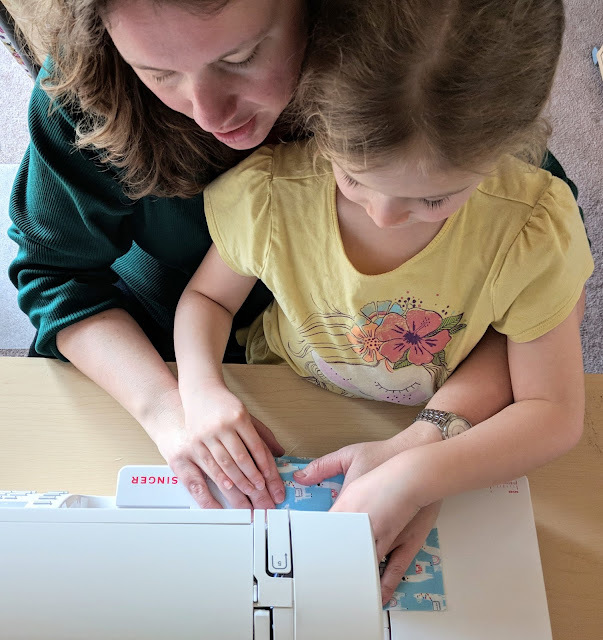 It's so practical, easy to follow, and especially helpful for sewing with very young children. Even though my girls are getting older (Mouse is 7, Bear is 8, and Bunny turns 11 this month), they got a kick out of the fun names that Nancy and her granddaughters came up with for the different parts of the sewing machine, and since they're a little more advanced, we were able to go into more depth about the features of my machine and how everything works. Along with the book, we received a package of notions from Clover that Nancy developed to go along with the book. There are some fabulous goodies in here. 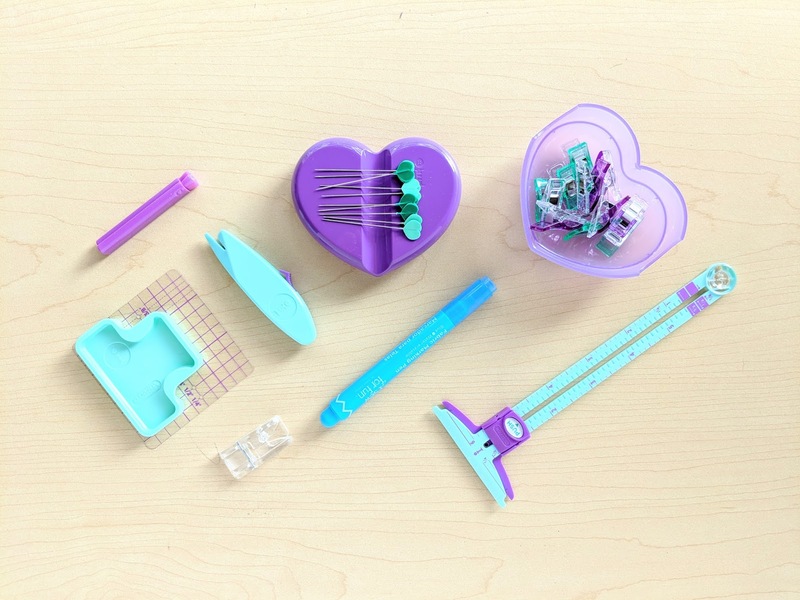 My favorite is the retractable seam ripper which turns into a thread cutter -- something I'll definitely be using myself. My daughters loved the large seam guide that makes it super easy for them to keep a straight seam allowance. Having their own set of Clover clips which we kept in the lid for the heart shaped pincushion was also a big hit. Adding or collecting clips is the perfect job for little kids, and it's probably what Mouse loves doing most. "This heart is all filled up with joy," she chirped happily as she kept adding clips to the lid while we were sewing together. 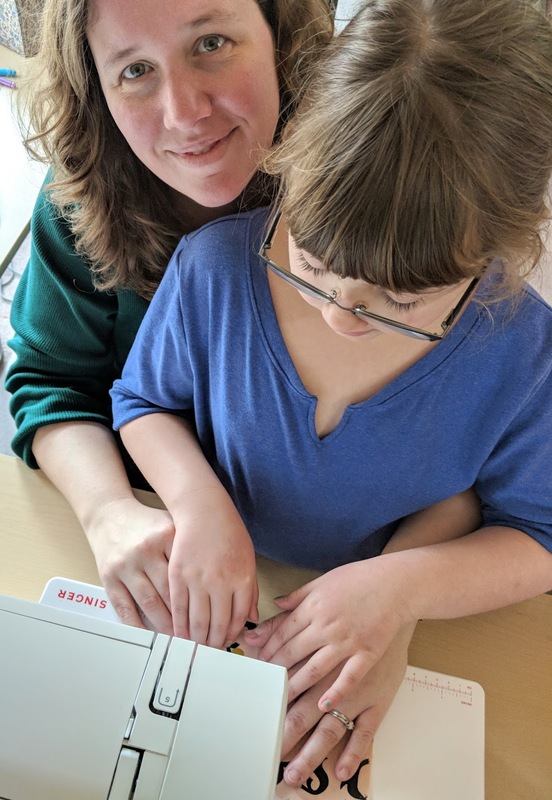 The projects in the book are each awarded a 1, 2, or 3 button difficulty rating (1 being easiest) to help you pick the right challenge for your child. My girls could probably have handled a 2 or 3, but everyone immediately went crazy over the cuteness of the stuffed animal sleeping bag, so we decided to go with that. 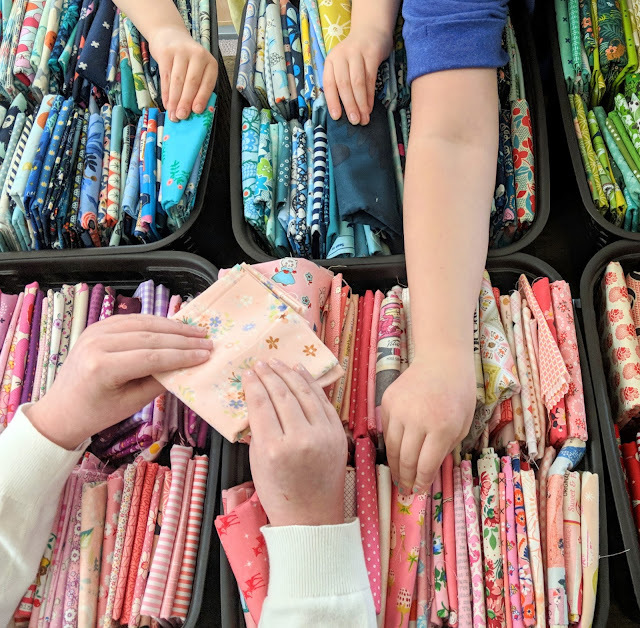 I let the girls choose their fabrics from my stash, and they had such a great time going through my color bins, which leads me to another lesson I've learned about sewing with kids: let them use the pretty fabric. The things they sew will be sitting around your house for the whole world to see, after all, so they might as well look good. I always make sure that the girls run their choices past me in case I'm saving a print for something special, otherwise everything is fair game. 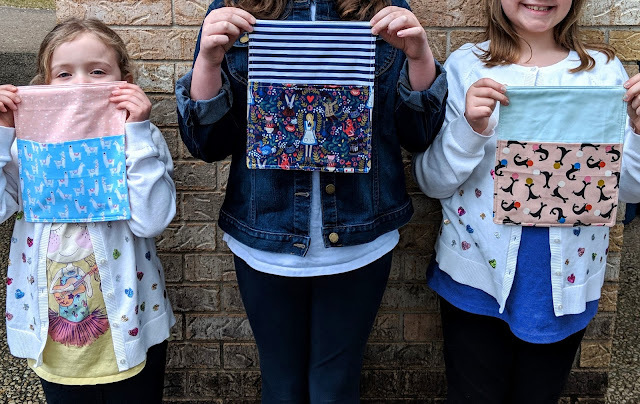 After the girls chose their combinations, I cut out the pieces for each sleeping bag, and then I had an appointment with each of my girls to sew their projects. I had originally used the idea of teaching their Blabberwockies to sew as a gimmick to get the girls excited -- not that they need any help with that when it comes to sewing -- but it wound up being surprisingly helpful. Instead of saying, "Keep your right hand here and your left hand there," it's so much more fun to say, "Let Tommy hold that side and Stuart can hold the edge by the seam guide." 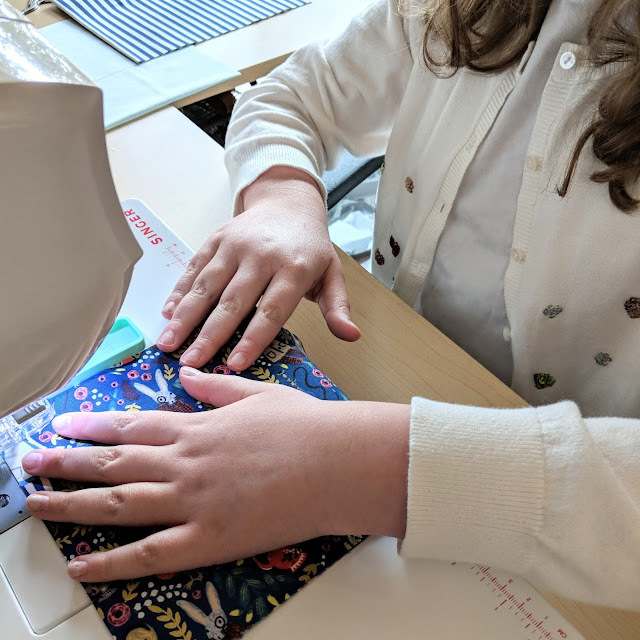 And while my girls might be distracted at times from paying attention, they had a great time making their Blabberwockies the most diligent students in the sewing room. "Sylvester's asking all my questions for me!" Bear laughed. 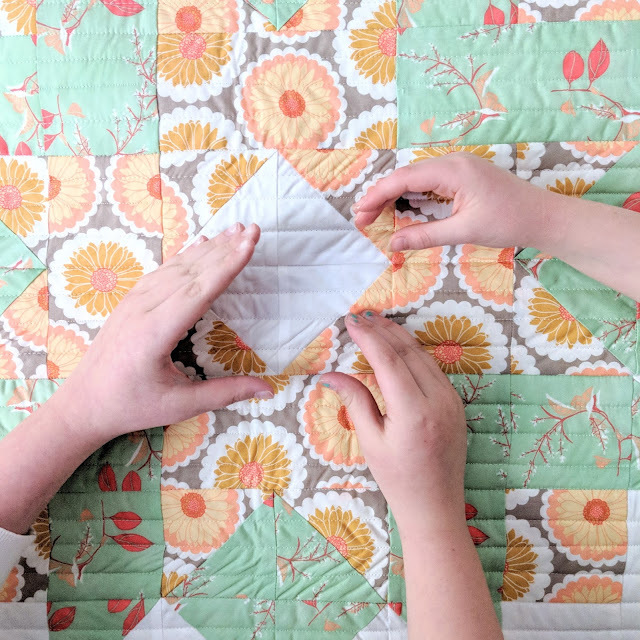 It's important to remember that sewing with kids is completely different from sewing by yourself. Everything takes at least four times longer with kids...at least...so be sure that you budget enough time rather than become frustrated because you're in a hurry. You can do almost everything more quickly or easily by yourself, but fight that urge and let the kids do it. The seam allowances aren't going to be perfectly straight and the points won't all match up. It will drive you crazy, but I promise, the kids won't care. They'll look at it and say, "I love it!" Because what matters isn't getting it done quickly or perfectly. You're making a special memory by sewing something with your child. The best thing about sewing with your kids is the conversations you have together while you do it. We talked about why caterpillars shouldn't smoke (thank you, Alice in Wonderland fabric), weighed possible fabric options for the Jet-Set Case (from my book) that Bunny wants to make for our summer road trip, and discussed all the plans for Edison and Hannah's upcoming wedding reception in the dollhouse this spring. And in between listening to their Blabberwockies crack their little jokes ("I had an extremely fun time, but the fabric tasted awful.") and stitching away at our projects, I get to see more of my daughters' hearts. I get to hear what they're feeling and doing and hoping for the year ahead. I've heard it said before that when children spell "love" they use the letters T-I-M-E. I truly believe that. My girls appreciate that I'm choosing to spend my time with them because I want to. They know that I enjoy sharing my fabric, knowledge and tools with them so that they can do what I do, and it means a lot . . . to all of us. I was heartbroken when I heard that Nancy passed away last year, partly because I missed the chance to know her. 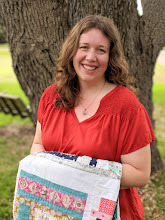 I never had the opportunity to take a class from her or talk with her, even though we both designed fabric for Riley Blake Designs. 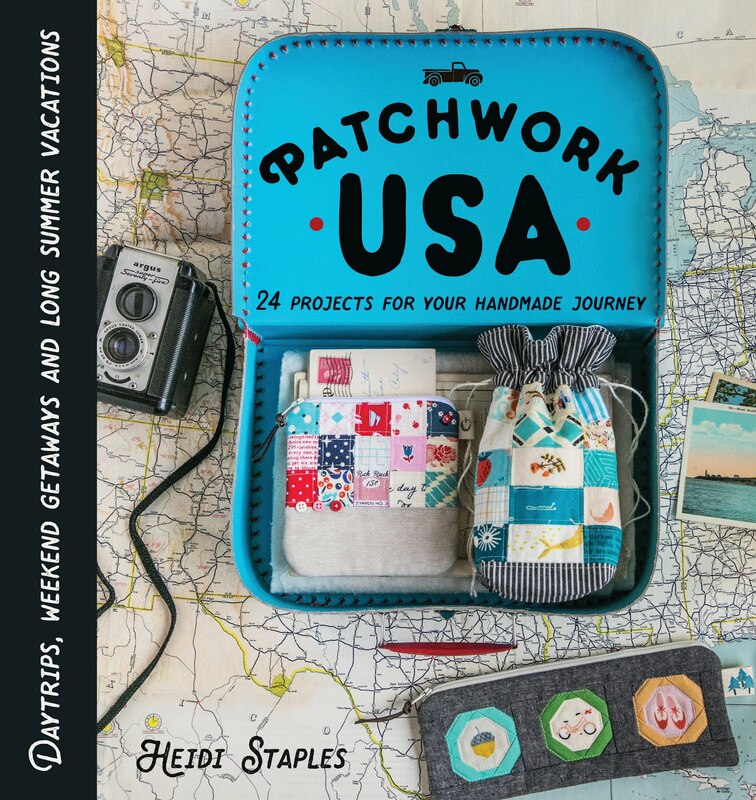 It was only a month later that I got the invitation for this blog hop, and I can't tell you how grateful I was to finally meet her through the pages of this beautiful book. Her heart is so obviously in every chapter, reminding us that no matter what age, we all sew for the same reasons: for the love of it . . . for the love of the people we sew for and with . . . for the fun. I can't think of a more fitting legacy for her to leave behind than that.